This is a guest-post by Dr Julie Walsh, global research fellow in sociology at the University of Warwick. Forgetting a word, a dream … I look for it, I don’t find it, it will come back to me. We have trouble admitting that what took place in us, was ours, can, like that, abruptly move away, vanish, be erased, disappear, not to be saved, dying. Falling permanently into the forgotten. A lost dream is a common complaint. Perhaps it seems wasteful that the vivid and surreal experiences that may occasionally delight us in sleep begin to fade before we’ve even woken up. If dreaming is taken as evidence of everyman’s latent artistry, then why wouldn’t we want to retain proof of it? Ann Veronica Janssens’ installation work, yellowbluepink, and Broomberg & Chanarin’s Every piece of dust on Freud’s couch are two recent London exhibitions that allow us to think about the hazy distinction between dream states and waking life. Both works question the limitations of ordinary sense perception: Jannsens’ by obfuscating that which should be as plain as the nose on your face, Broomberg & Chanarin’s by reminding us how the small matter of the past leaves its trace in the present. I offer the following reflections on these two art projects by way of an engagement with psychoanalysis, a discipline that works in the service of trying to see things clearly. Sometimes this involves the close investigation of a minute particle of a patient’s material – days, if not months and years, might be spent splitting a single hair on the couch. But sometimes, seeing clearly requires a less forensic approach: to allow everything to fall out of focus, to loosen our grip on familiar and intimate objects, in order that they can be reencountered in a different state of mind. 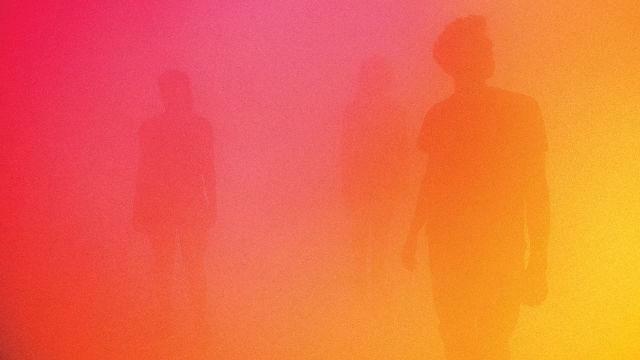 yellowbluepink is the title of Ann Veronica Janssens’ installation work, which is first to feature in the Wellcome Collection’s ongoing series States of Mind. The colours of Janssens’ title refer to the play of pastel light diffused throughout approximately 180 square meters of gallery space that you enter via air locked doors. In between the mists of yellow, blue and pink hang green, orange, red, indigo – enticing you to roam around the colour spectrum, experiencing the collapse of background and foreground, surface and depth, characteristic of dream states more so than waking life. By way of preparation for the disorienting effects of the installation, you are advised to move slowly once inside, not to lie down at any point, and if you do feel uncomfortably off-kilter to make contact with a parameter wall and follow it round to the exit. These words of advice are welcome for this is indeed a rare and immersive space which suspends ordinary perceptual registers, and in which you are invited, somehow, to lose yourself. As an aesthetic experience that speaks directly to the body, yellowbluepink provokes a degree of disembodiment – people negotiate the space with their arms stretched out in front of them, as if their eyeballs had dropped down to their fingertips. Consequently, you’re likely to emerge from the experience affected: perhaps bewildered, agitated, or quietly contemplative. The sensory immediacy lingers once you have walked back through the air locked doors and are confronted with the change of mood – your own, and that of your immediate environment. On the occasions of my visit, I overheard descriptions of the installation’s dreamlike or filmic qualities; a woman remarked to her companion that it was like being dropped into Monet’s Water Lillies, and a small boy explained to his carer that he was ‘warmest’ in the yellow, but now he needed his coat back on. If, as I have interpreted it, Janssens’ work can be taken as an invitation to lose oneself, then we might imagine that it stages similar pleasures (and problems) to those rehearsed in childhood when, through variations of peek-a-boo and hide-and-seek, we begin to experiment with the phenomenon of vanishing. When I visited the installation with a friend, we kept playing a game together: we would stand side-by-side somewhere in the centre of the room, before one of us would walk away from the other. After only a few steps, the walker would glance back over their shoulder and, already, the other one wasn’t there to be seen. As soon as the space opened up between us, the coloured mists rushed in to obscure that which we expected to remain in view. Conversely, in this generalised myopia, people came into focus too suddenly, an entire body and face – a stranger’s face – would abruptly break through the magical distance of an arm’s length, and place itself within reach. ‘I didn’t see you there!’ I could have said to the ghostly figures that seized my attention with their unexpected proximity. All of this to-ing and fro-ing, this peek-ing and boo-ing, put me in mind of the famous ‘Fort/Da!’ game that so intrigued Sigmund Freud. ‘Fort/Da!’ is the game Freud observed his eighteen-month old grandson playing: The child was amusing himself by repeatedly throwing a wooden bobbin over the side of his cot in order to declare with delight that it had ‘gone’ (fort), before using the thread still attached to the bobbin at one end and secure in his small hand at the other, to pull back the object he’d vanquished just moments earlier, declaring with equal delight its return (da!). The pleasure that the child takes from playing disappearance and return with his toys is understood as the pleasure of mastering the absence of a loved object. Because mothers, like all loved objects, are always threatening to remove themselves from the child’s presence (cue ‘separation anxiety’), then the capacity to dictate the movements of a substitute object – indeed, to keep the substitute object hanging by a thread – is understood to satisfy the child’s need to assert his command over his environment, and perhaps satisfy his desire to punish those elements of his environment that disrupt his easy play. It was me, rather than my friend, who initiated our game of disappearance and return, and me who insisted on doing most of the walking away. I found there to be something strangely addictive about the glance over my shoulder that confirmed that, at a distance of just a few feet, my friend already wasn’t there to be seen. It was as if I’d disappeared her. And how I enjoyed my little magic trick! But as novel as this was, it was also intensely familiar. Around about the same time as Freud was watching his grandson’s tireless engagement with the wooden bobbin, he was developing his account of the uncanny (un/heimlich). Though expressing some caution regarding the application of his science to the field of aesthetics, Freud clearly felt he could contribute to the extant literature on the topic; primarily, he suspected that it was not sufficient to say that the uncanny was ‘something one does not know one’s way about in’. The peculiar, contradictory sensations experienced under the sign of the uncanny could not, for Freud, be satisfactorily accounted for on the basis that ‘the better orientated in his environment a person is, the less readily will he get the impression of something uncanny in regard to the objects and events in it’. In other words, environmental adaptation doesn’t cut it, for no matter how rehearsed we are – how many times the child throws down and then retrieves his toy – there is something that cannot be mastered. Which means that to identify ‘intellectual uncertainty’ as the ‘essential factor in the production of the feeling of uncanniness’ is to miss the point. But what, then, is the point? Only the vanishing point of death. Freud supplements the story of his grandson’s ‘Fort/Da!’ game with a further example from the child’s repertoire: this time, there is no bobbin, just the child and a mirror. The mirror, we should imagine, is free standing on the floor, with just enough of a gap at the bottom so that the child can crouch down low and remove his reflection from his sight. What next? Why, exactly the same! Disappearance and return. Freud comments that his grandson takes great joy in making ‘baby gone’, as if his early experiments in erasure are a lesson to us all. Perhaps we are necessarily short-sighted with respect to death. Because even if we’re staring it in the face what can we truly say to it? Never enough. Can we ever, in fact, advance on ‘baby gone’? Death is the one state of mind (or state of non-mind) that we cannot know. And yet how hard we try to know it. Broomberg & Chanarin’s Every piece of dust on Freud’s couch was commissioned by the Freud museum, the Hampstead house where Freud (and his couch) found respite in their final years of working life. Like any self-respecting domestic museum, 20 Maresfield Gardens assures its visitors that key areas have been maintained in the manner of their original usage. With the couch as its centrepiece, the museum privileges Freud’s study as the site that remains ‘preserved exactly as it was in his life time’. The artists behind Every piece of dust deployed a team of forensic scientists to undertake an analysis of the Persian Qashqa’i rug that has adorned Freud’s couch for the last 125 years or so. Predictably, in amongst the household dust retained in the rug’s pile was protein from skin, hair, and cloth fibres containing human DNA. These findings were captured in a series of high-resolution radiographic quartz images, which then provided the visual template for a set of large woven tapestries constructed to the same dimensions as the original rug upon which Freud’s patients famously lay. Throughout October and November of this year, the first of the woven tapestries could be viewed in situ on the couch at the Freud museum representing an ‘abstracted portrait of one of its sitters’. Within the context of a familiar homely aesthetic – the dark furnishings, the rugs on the floor, the heavy velvet curtains, the stone busts, the leather armchair, the shelves lined with books, and Freud’s treasured collection of antiques and curios – the temporary technicolor couch cover strikes an odd note. Reminiscent of a gaudy beach towel perhaps, thrown down by the scientists from the future seeking to colonise the most sought-after lounger at the Freud hotel. It is fitting that Every piece of dust foregrounds the psychoanalytic truism that rarely do we know what lies beneath the surface, for so much of what is noteworthy in this artwork remains, necessarily, out of sight. Most obviously, we don’t get to see the process behind the final piece: the point at which the forensic team entered the museum in their protective white suits, with their tools in their gloved hands, and gathered the evidence for inspection. Nor do we receive much insight into the rationale behind the project; what did the artists imagine would be revealed in their capture of the microscopic life of the couch? And how might the work of bringing such matter to life be in keeping with the activity of psychoanalysis (or, for that matter, museum curatorship)? Now, of course, it might be said that because the artwork is obliged to speak for itself, my desire for the artists to make plain something of their background thinking is entirely besides the point (though where better to confess this desire than in front of Freud’s couch?). However, it mattered to me what the conceptual coordinates were for this project: how forensic science was being brought to bear on a space of dreaming and fantasy; whether the often misguided notion that technology helps us to know more – to see more clearly – was being challenged here, or simply reproduced. It also mattered to me that the guiding metaphor might be that of material evidence: the idea that the closer we get to something – the more evidence we have – the better equipped we are. But equipped for what? The accompanying text to the exhibit explained that the human DNA extracted from the rug’s pile ‘may include traces of Freud’s early patients such as ‘Dora’, and the ‘Wolf Man’. What are we to make of this? Surely such an assertion could only excite the type of fetishist for whom ‘evidence’ has become the sought-after object. And isn’t this precisely the type of fetishist that now populates our public discourse; the man of science who is looking for proof of his existence – in his brain, in his genes, in his DNA. Fantasies of detection abound in psychoanalysis as elsewhere. Like the reconstruction of a crime scene, the trick seems to be that we can piece it all together if we locate the right evidence, and hold on tight to it: then, once we’ve found ourselves, we can close the case! The framing of Janssen’s yellowbluepink installation moves us in a different direction; it is a space that contains the potential to play with the experience of vanishing. Although it isn’t in fact possible to go so very far without being brought back to the common boundaries of everyday life: the plug sockets at shin level were discernible from about three meters, as were the lines where the wall panels joined, and, when you looked up, the infrastructure of the lighting was easily detectable. Personally, I resented these reminders that I was in a curated and finite environment which would, in time, be dismantled and returned to the mundane laws of the everyday. I came away from Janssen’s installation wanting to be set further adrift from my friend, and further adrift from myself. A deeper immersion in the mist would have meant a more intensive disconnect from the horizons of my mind’s eye – further to fall, in other words, and a more prolonged rehearsal in letting go. yellowbluepink is on at the Wellcome Collection until 3rd January 2016. Every piece of dust on Freud’s couch is no longer viewable at the Freud Museum, though dates have been announced for its tour in 2016-17 on the artists’ website. This entry was posted in Art and emotion by Jules Evans. Bookmark the permalink.